“My mission in life is not merely to survive, but to thrive; and to do so with some passion, some compassion, some humor, and some style”. Maya Angelou. Our Matriarch always had a great sense of style. With a background in dance, singing and entertainment Maya Angelou’s style was always in the details often seen in a one of a kind handmade gown or a colorful headscarf. We are very excited to share the “Still I Rise” line by Storiarts. 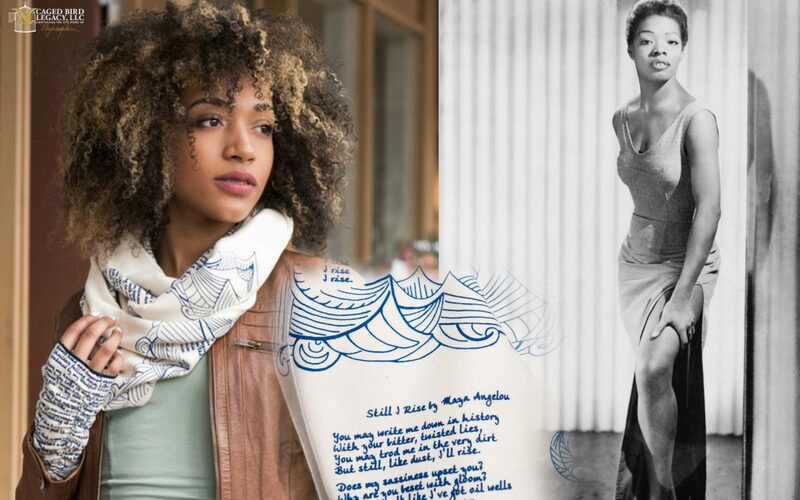 This affordable wearable poetry of Dr. Angelou’s will not only keep you reading, fashionable and warm, but by supporting the “Still I Rise” line you will support the same charitable organizations, schools and health centers Dr. Angelou contributed to and our family continues through the Caged Bird Legacy LLC. Please visit our store to further view and purchase “Still I Rise”. The Angelou Johnson Family. Please visit our store to further view and purchase “Still I Rise”.